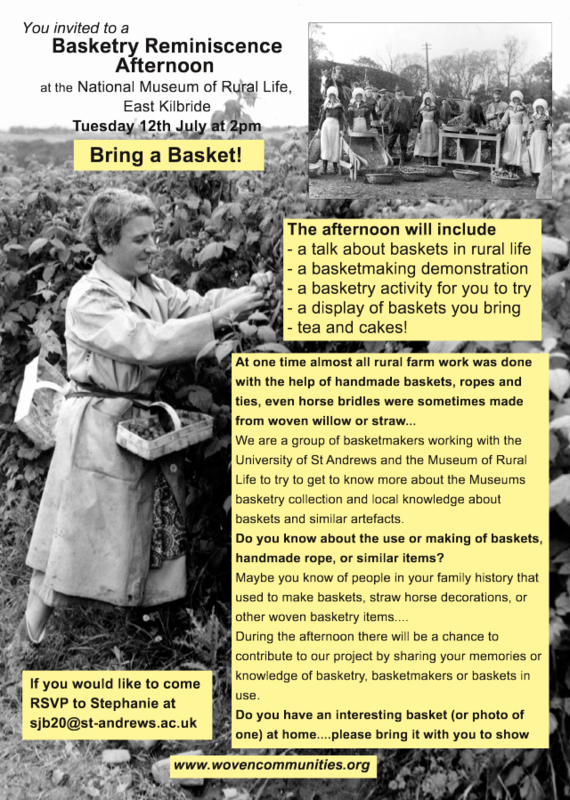 You are invited to a Basketry Reminiscence Afternoon at the National Museum of Rural Life, East Kilbride on Tuesday 12th July 2016. At one time almost all rural farm work was done with the help of handmade baskets, ropes and ties, even horse bridles were sometimes made from woven willow or straw. We are a group of basketmakers working with the University of St Andrews and the Museum of Rural Life to try to get to know more about the Museums basketry collection and local knowledge about baskets and similar artefacts. Do you know about the use or making of baskets, handmade rope, or similar items? Maybe you know of people in your family history that used to make baskets, straw horse decorations, or other woven basketry items. 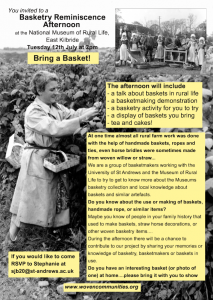 During the afternoon there will be a chance to contribute to our project by sharing your memories or knowledge of basketry, basketmakers or baskets in use. Do you have an interesting basket (or photo of one) at home …. please bring it with you to show.